Jan 16, 2017 Thank you for bringing this situation to our attention. We regret the delays in your installation. We never want our customers to be inconvenienced, and we realize that this was a frustrating experience. We would like to know more about the situation and follow up with you to ensure everything is getting resolved, but we are not able to locate your account with the information posted here. 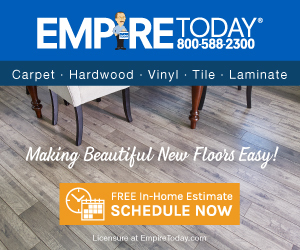 Please call us at 888-588-2315 x4195 or email your contact information to customersupport@empiretoday.com, and we will reach out to you. Empire Today came and installed my carpet on a Thursday, We assumed it would be done by the end of the day, so we rented a Uhaul, packed up from White Cloud -Mi and came to Lawton,MI, to our new home and when we got there, they only did one room and left at 5 pm. Now we have all of our belongings in a uhaul truck and can't move in. They said they would be back the on Saturday. When they did not show upon Saturday, we called the Rep. (the person who sold us the carpet) and he assured us they would be out Monday to finish. When they returned Monday it was 11:45 am. They got all the carpet installed and promptly left at 5pm, without cleaning up anything .they left a huge mess , vent openings were carpeted over, doors left off the hinges and bits and pieces of carpet everywhere. Our belongings have now been in a Uhaul that we had to pay extra for for 4 four days. We then contacted Empire Today and they said they would reimburse us for some of the cost. Since we are buying a HUD home and it needed much work before we could move in we had to hire a contractor, ( FHA required us to do this.) We have shown Empire proof of ownership of the home and they still are going to give the money to the contractor. To whom we have already paid in full. It has been over two weeks since all this has happened and they still have not reimbursed anyone. Review #527000 is a subjective opinion of User527000.